Feel like a star walking the red carpet at the Oscars thanks to the huge savings going on right now at The Body Shop Canada. Shop some of your favorite items to get up to 50% off your entire order. The more you buy, the more you save at this rare event! Combat the harsh conditions of winter and the havoc it can have on your skin with the help of lotions and body butters. My fondness for chocolate would explain why I was instantly drawn to this cocoa body butter, displayed on the right. Starting at $20, it gradually goes down in price as you add more items to the order. Purchasing 5 of these skin nourishing and exquisite skin care products will come out to $50 as opposed to $100. 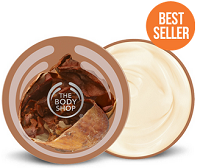 If you would like to stay aware of any future promotions from this brand, make sure to take a look at our The Body Shop Canada listing page.